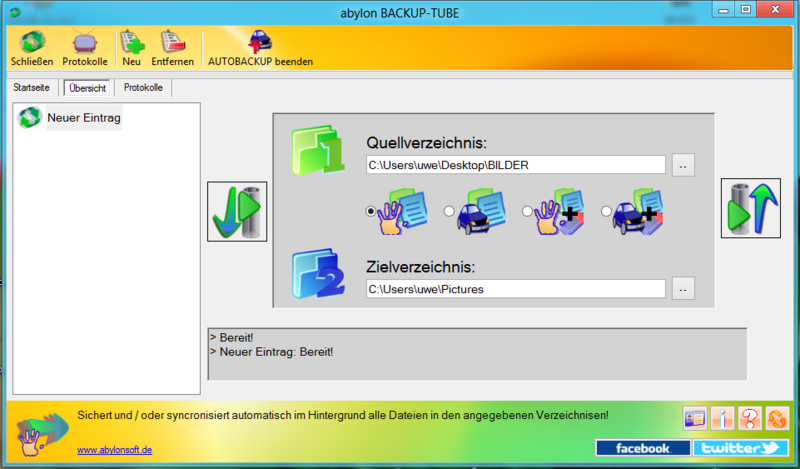 abylon BACKUP-TUBE: Backup and synchronize files manually or automatically. - abylon CRYPTDRIVE: The USB installation is not possible due to technical reasons and is no longer shown in the settings. - abylon KEYSAFE, abylon BASIC, abylon CRYPTDRIVE, abylon ENTERPRISE: The accidental display in the settings for the CT32 DLL and the Administration Server has been solved. - abylon BACKUP-TUBE: The unwanted dialog for opening a file on the log page is no longer displayed. - abylon BACKUP-TUBE: An unwanted memory increase has been fixed. - abylon LOGON Business: Administration in networks would be optimized so that the workstation mode is now generally active. This means that in the workstation and domain environment, the administration server can be freely selected by specifying the computer name. - abylon BASIC, abylon ENTERPRISE, abylon UAC-GRABBER: improved icon view in Treeview view. - abylon CRYPT in the BOX: Now all GUI elements are displayed correctly with large fonts. - abylon BASIC: Internal evaluation of the UserConfig.XML is correct again. - abylon KEYSAFE: Keysafe usernames still do not accept changes from uppercase to lowercase and vice versa. To make this change, an additional character must be temporarily added to the username, which can be removed again in step 2. - abylon BASIC, abylon SHREDDER, abylon CRYPTDRIVE, abylon CRYPTMAIL, abylon SHAREDDRIVE, abylon LOGON, abylon LOGON SSO Pro, abylon READER, abylon LOGON Business, abylon ENTERPRISE, abylon KEYSAFE: In the settings under the tab Administrative Settings there is now the option Allow settings dialog only for administrators. With activated function the settings dialog can only be opened if the user is in the group of administrators. - abylon FREEHASH: In the application abylon FREEHASH some display problems would be solved. - Cross-program: The waiting dialog when starting the application is now displayed as a simple hexagon with program name. - abylon KEYSAFE, abylon LOGON SSO Pro: The automatic monitoring of application windows for autopmatic training was removed for performance reasons. New logon dialogs can now be taught-in via the tray icon and the menu entry Teach-in new application window. - Cross-program: Negative window coordinates are now intercepted programatically. In addition, the unpredictable jumping of the window while slicing would be prevented. - abylon BASIC, abylon SHREDDER, abylon CRYPTDRIVE, abylon CRYPTMAIL, abylon SHAREDDRIVE, abylon LOGON, abylon LOGON SSO Pro, abylon READER, abylon LOGON Business, abylon ENTERPRISE, abylon KEYSAFE: Die Funktionalität RemoteAdmin wurde aus allen Modulen entfernt, da der Registrierungszugriff über das Netzwerk seit Windows Vista nicht mehr zuverlässig funktionierte. Mit der Software abylon LOGON Business werden die auf dem Server definierten Einstellungen über ein eingeschränktes Benutzerprofil an die Clients verteilt. - Programmübergreifend: Drag&Drop-Operationen über Fenster mit unterschiedlichen Rechten werden nun mit dem Symbol Kein Eintrag angezeigt. Beispielsweise können keine Dateien aus dem Datei-Explorer (Benutzerkontext) in unsere Dialoge gezogen werden, wenn diese mit Administratorrechten gestartet wurden. Dies wird auch oben im Dialog angezeigt. - abylon SHAREDDRIVE: The stability of the software has been improved! - abylon SHAREDDRIVE: Optimization of the GUI: 1: The structure of the file lists has been optimized to avoid flickering. 2. the icons were optimized and are now displayed context-related. 3. problems with the display have been fixed. - abylon LOGON Business: Occasional login problems under Windows 10 could be fixed. - abylon LOGON Business: The login in blocking mode is done as follows when selecting an unregistered user: Under Windows 7 a note is displayed and under windows 10 the selected user is logged in next to the active user. - abylon LOGON Business: Restricted users can now open the logon settings dialog in restricted mode. - abylon CRYPT in the BOX: Various optimizations: 1. correct display of the path in the upper bar. 2. fixed problems with deactivated window. 3. function icons are now displayed context-related. 4. the extension of the lists was optimized, so that it flickers less. - abylon KEYSAFE: When clicking on the "dash" the dialog is now correctly minimized to the tray icon. - abylon KEYSAFE: By default the option "Single SignOn (SSO)" has been deactivated. In order to be able to use SSO, this must be activated first. - abylon KEYSAFE: The distance of the individual Keysafe entries in the list was reduced again. - Cross-program: The problem with jumping windows has been fixed. - abylon LOGON, abylon LOGON SSO Pro, abylon LOGON Business: The automatic password administration has been deactivated. - abylon LOGON Business: Especially under Windows 10 the card monitoring did not start or run stable. The software monitors the start of the card monitoring and guarantees an error-free monitoring of the card drawing and plug-in events. - abylon LOGON Business: Problems with network sharing in a domain environment have been corrected. - abylon LOGON Business: Due to problems with the synchronization of the logon accounts, the abylon LOGON gets stuck. This was compensated by the use of the local sync user. - abylon LOGON Business: The logon settings can now be made centrally on the server. The sync user distributes the settings to all connected computers and takes them over there. This is done by activating the admin mode, which means that no settings can be made on the clients. - abylon LOGON Business: Due to the activated admin mode or not existing rights deactivated functions now show a message, so that the user is informed accordingly. - abylon LOGON Business: In the settings on the page "Logon Accounts" the created accounts can be searched for the card ID for example. The computer serves as a huge data store for documents, pictures and videos. These documents often typify an enormous sentimental value. Through accidental deletion, hard drive crash or a malicious software that data can be irretrievably lost. But the annoyance by such data loss can be avoided. The software abylon BACKUP TUBE creates exact copies of all files and directories. The backup or synchronization job can be done automatically or start manually. Intelligent routines speed up the backup process and reducing the amount of data. Only changed or new files are copied to the backup store. In the case of sync-jobs also deleted or renamed files in the source directory will be changed in the destination directory. This leaves the data backup always up to date and simplify the file restoring in the worst case. Thanks for the Giveaway! Appreciate it! Need a good backup plan! With our software, you can select individual folders and store automatically or manually as a backup. I hope that this software works as well as it claims! I will be sure to provide some feedback after I try out this program. Thanks for providing so many awesome programs for free. I have got and use many programs from you over the years. Thank you for your confidence. Feedback, suggestions and criticism is always welcome. Ready to try! Sounds gteat. Thank you Sir, for your esteemed software for free. Thanks again.